Lilium lancifolium is one of several lilies that go by the common name of Tiger Lily and considered one of the earliest lilies to be domesticated. It was introduced to the Royal Botanic Gardens at Kew by William Kerr who "discovered" several popular garden plants in Asia when he wasn't busy supposedly getting high on opium. Last year there was an article in the NYT about Chris Wiesinger who is a modern day bulb hunter that really inspired my desire to collect this lily for my garden. I found a clump of these lilies growing on abandoned property and decided to collect them before they built a new house on the vacant lot. I was surprised at how large the bulbs were and how well rooted they were in such poor soil. After disturbing them I didn't think they would bloom this year but all of the stems that have shot up are loaded with blooms. While admiring these blooms I have to wonder why they are commonly called tiger lilies if tigers have stripes and the flowers have spots. Wouldn't it make more sense to call them leopard lilies? Anyway... they grow on erect, fuzzy stems that produce bulbils at the leaf axis and flower at about 4-5 feet tall. The plant is suppose to be edible expect for the pollen which I read is poisonous. You can take the bulbils and plant them to propagate this plant or pass them on or plant them in other areas of your garden. The bulbils that I planted last year already are producing bulbils of their own and I'm wondering if this is a bad sign for the future of my garden. From my observations I don't think this plant is very popular with Chicago gardeners and I wonder why. It seems to be a hassle free perennial that has rewarded me with a lot of color and height in my garden with very little water. Since it was growing in a garden that hadn't been tended to in years I decided to allow it only to get rain water and even though they are growing in full sun I haven't seen any signs of stress. Maybe these flowers aren't as pretty as the ones Chris Wiesinger sells on SoutherBulbs but I think they'd make a great addition to a garden. BTW; Chris if you ever happen to stumble across this entry you really should start a garden blog to go with your site. I'd read your blog entries on rescuing bulbs and the blogosphere could use more male garden bloggers. Thanks for stopping by and commenting. I didn't include the info on the supposed ability to transmit a virus because I couldn't find info on that satisfied what I read on Dave's Garden. The first page of results on Google for Lilium L. don't make mention of it in particular the USDA profile on it. But many websites do mention that the plant is used in Asia in cooking and as a medicinal plant. The profile page on pfaf.org references several books that state the bulb and plant is edible and tastes similar to a turnip. Hope this helps and thanks for the offer of the list. I have some similar to this in bud; I enjoyed reading the information and how you "rescued" them. Re; yor comment on my blog....I'm pretty sure it is a Hover fly though since I've started trying to identify insects I've learnt that many flying insects look similar. 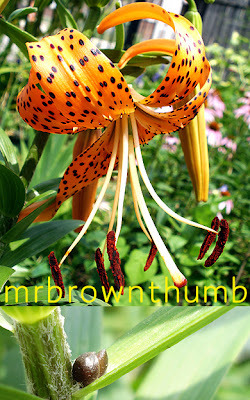 Tiger lilies are so pretty and carefree.We do not grow any but Tiger lily and a plain yellow with a few brown spots. Last year the Tiger lilies in our garden grew very tall about the height of the low end of the garage.What is that maybe 61/2 feet. This year the tiger lilies are only about the same height as I am.But the stems are thick and strong with lots of flowers, no worry about plopping in the rain or wind. Does anyone find that the bulb manages to drill itself way deeper than you actually planted it, when you go to divide them, or share them with a friend? I've dug up all kinds of bulbs, but these are odd about doing this. Cathy, your flowers look way larger than mine. Anonymous, I have noticed it and it has a name but I can't think of what it is called. I'm guessing it is an evolutionary adaptation to help the bulblets get a chance at becoming bulbs or else they'd dry up in the sun. There is at lest one seed that also digs itself into the soil. I understand the bulbils do that, but I was actually talking about the mature bulbs that I transplanted from another site and knew no "silting" had happened between all the times I dig them to share with others. The bulbs seem to be on their "way to China". No matter how I plant them they burrow very deep, making it difficult to dig them without slicing the "stem". There is a wild grass that grows here with a sharp black "dagger" point and a corkscrew tail that responds to weather changes and spirals the "drill head" into the soil. I can't remember the name at the moment, but I remember the comment that scientists were looking into unusual grasses that might make new medicines.